I am sending you this email in hopes that you will consider registering your team(s) and/or sharing the news about our first annual “Shine the Light” ALL GIRLS soccer tournament. The tournament will showcase all girls teams from Ontario (non OPDL) in the following age brackets U13, U14, U15, U17 and U19. This is the first year for the tournament and our goal is to make this one of the strongest and most completive girls soccer tournaments in the province. We want all the athletes to have an incredibly fun experience while fundraising and creating awareness for the ‘Shine the Light Campaign. 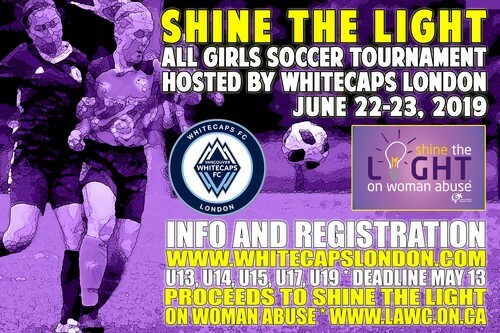 More info about Shine the Light here: https://www.lawc.on.ca/shine-light-woman-abuse-campaign. The tourney will take place June 22nd and 23rd in London Ontario at the North London Soccer Fields. 1225 Adelaide Street. London, Ontario.